Basic questions are tools in qualitative research. Write them in the focus group questionnaire - the moderator's guide. And ask them. A question is an inquiry that produces data. And data leads to information and knowledge. We'll examine five different types of basic questions. Open-ended questions are the stock and trade of qualitative marketing research. They allow people to answer in any way they see fit. Open-ended questions do not impose answers on people. They allow expression. So, use open-ended questions often and widely in focus groups and depth interviews. Open-ended questions start conversations and keep them going. Open-ended questions can discover unknown topics and explore them. They can produce rich, deep, and unexpected answers. In contrast, closed questions impose answers and limit expression. Closed questions are the stock and trade of quantitative surveys. They allow researchers to count answers and apply statistical techniques. Researchers measure, size, and forecast using closed questions. A closed question restricts or narrows answers. In this example, the answer is either yes or no. Other examples of closed questions include quantitative survey questions, which provide a range of answers. In qualitative research, closed questions help clarify and confirm something specific. You use open-ended questions to explore, discover, and expand. Then, you dig beyond top-of-the-mind answers. A method to dig beyond the top of the mind is to use the four-question sequence. The four-question sequence consists typically of four parts. You start with a main question and listen for its answer. Then you follow up and inquire about the answer. Then you probe to clarify. And, if necessary, you prompt. A prompt is a cue or aide. The main question is an open-ended question. It starts a discussion about a subject. There are typically several main questions within each general topic. For example, you may have five main questions under the topic of awareness. Write main questions in the focus group questionnaire - moderator's guide. The follow-up question inquires about the answer to the main question. It gets details and expands answers. Often there are several follow-up questions to one main question. Anticipate follow-up questions. Write them into your interview guide. Here are some categories of follow-up questions. When you hear facts, ask what the facts mean. When you hear situations or events, ask about causes and outcomes. When you hear problems, ask about causes, ramifications, importance, and solutions. When you hear about things that affect people, ask about response. The interviewer writes follow-up questions in the interview guide. Or improvise follow-up questions during the discussion. Write follow-up questions until they become a habit.Write them in the focus group questionnaire. Then improvise during conversation. The main job of the probing question, which follows main or follow-up question, is to clarify. Here are a few examples of probing questions. Know them well and use them. Besides probing questions you ask, you can also use silent probes. Use a puzzled facial expression. A prompt is a cue or aide. Prompts aid recall by triggering a memory association. Prompts help respondents talk about something you are interested in, but they have not talked about voluntarily. Prompts can be brands, products, activities, names of things, and people. Write prompts into the discussion guide. That way you won’t forget. Write a list of probes in the focus group questionnaire. Rehearse them until you know them cold. An effective interviewer asks main questions, follow-up questions, probes, and prompts. They dig beyond top-of- mind answers. They expand and get important details. Make the four-question sequence part of your routine. Write the four-question sequence in the focus group questionnaire or moderator's guide, until you become comfortable. Practice it. Master it. With enough practice, you’ll be able to improvise the four-question sequence on the spot. A jazz musician practices scales routinely. Improvisation comes from mastering the scales. The same holds true for moderating. Master the four-question sequence and you’ll become skilled at improvising a directed conversation. Try it on friends and family. Your interviewing skills will improve with practice. Moderating will become conversational. Writing focus group questions in the moderator's guide or focus group questionnaire is your first step. See the article about moderator guide. It illustrates how to order questions within a topic of inquiry. Also, check out the article about basic question tips. Once you learn basic questions, try laddering. 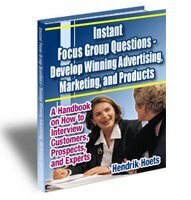 Instant Focus Group Questions e-book is packed with over a hundred focus group questions. Learn more and download it today.